If you thought VAT was somewhere to store whiskey, it can be a bit of a shock to discover that, in business, you can become an unpaid tax collector for the government. You can become a part-time VAT man, (or VAT woman). Often, the business of your business is time consuming, technical and maybe even tedious. You know about that stuff. But after a while in business, lots of phrases routinely fall from your lips, such as “cash flow management”, ”claiming the VAT back” and heaven forbid, “moving forward” and you may not even realise that you don’t actually know what these phrases mean. In fact, many business people don’t know what those first two phrases mean. And everyone knows the last phrase is, well, quite meaningless. However, if you understand the VAT collection mechanism, (it’s simple), you can exploit the timing of invoices to improve your cash flow considerably. Value Added Tax is an indirect tax on consumers. It’s called Value Added, because a business pays VAT on the value that it adds to a product or a service. For instance, if your business made plastic bowls, you would buy in plastic granulate and then, through labour and the manufacturing process, you would add value to the plastic to make a bowl. In VAT terms, you would pay VAT on the purchase of the granulate, but be able to claim that VAT back from the Government. When you sell the bowl, you would pay VAT on the sale price, which would be a bigger figure. It’s bigger, because you have to make a profit – a profit that you earn through value add. You can offset VAT paid against VAT on sales and pay net difference over to the Revenue. Businesses have to register for VAT in the Republic of Ireland as soon as their turnover (sales) in a given year exceeds a certain threshold. Currently this threshold is €37,500 for the supply of services, and €75,000 for the supply of goods. Once you are registered you have to charge VAT on sales, and clearly show the VAT charged on your customer invoices. In your private life as a consumer, you pay VAT on goods all of the time without even realising it, on cups of coffee, on newspapers and yes ladies, even on shoes. Sadly, none of the VAT on the items in your private life can be claimed back. In your business life. you can only claim back VAT on your business expenses, so don’t claim back the VAT on your wife’s birthday present. There are some restrictions on what you can claim in your business too, and you should check these out with your accountant. You can only claim VAT back on goods or services for which you have an invoice. You claim VAT back by reference to the date of the invoice. The examples below illustrate the VAT story of Fred, a graphic designer, and show how in general you “get the VAT back” on purchases by offsetting it against the VAT that you owe on sales. If your turnover is less than €1,000,000, then you can apply in writing to your local VAT office to pay VAT on the “Cash Received” or money received basis. This means that you only have to account for and pay VAT on sales as soon as your customer pays you. This is a huge boost to your business, as you don’t have to pay the VAT over to the Revenue until you have it in the bank. If you don’t elect to be on a Cash Received basis, you have to pay over the VAT based on invoices raised, which means you are out of pocket in relation to the VAT until your customer pays you. So if your turnover is less than €1,000,000, it’s a no-brainer to elect to account for VAT on the Cash Received basis. 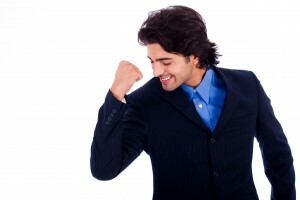 Delightfully, the VAT on a purchase invoices can be claimed back as soon as you receive the invoice. This gives you another cash flow advantage, as you can, by skillfully managing your suppliers and VAT claims, claim VAT back before you have even paid it. As long as the invoice date is within a VAT period, you can claim back the VAT in that period.Let’s say you employed me to write you a business plan for €5,000 + VAT @23% in October, and I offer you 30 days credit from date of invoice. 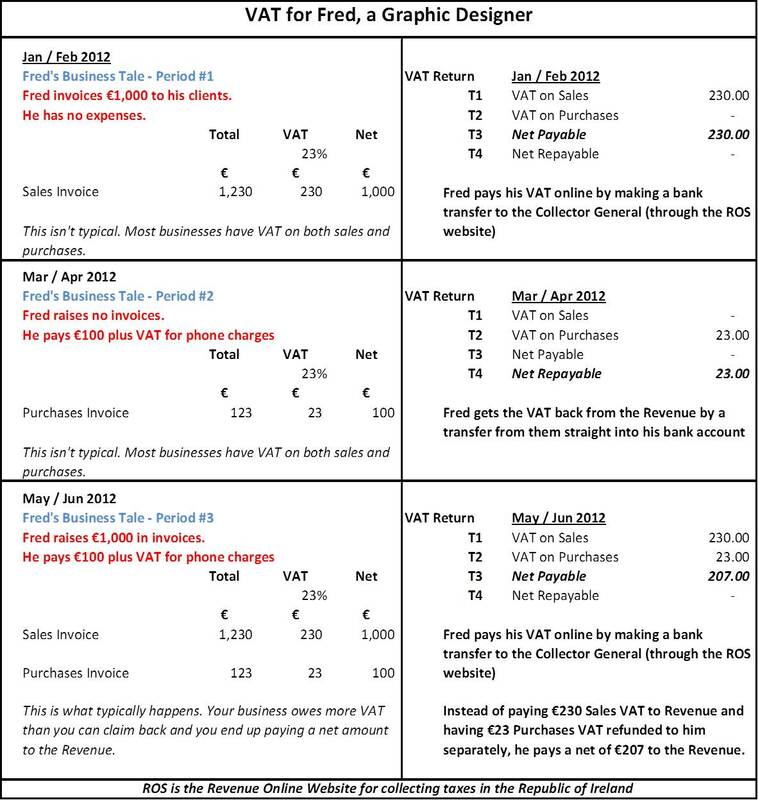 If I issue you with an invoice on or before October 31, you could claim back the VAT, €1,150 in the Sep/Oct VAT return. You could have the VAT back by mid November, (assuming you file a VAT return in early November), so you would be cash flow positive on the deal at that point. You wouldn’t have to pay me until the end of November. (Remember you have to pay me the full invoice amount, both my fee and the VAT, of €6,150). On the other hand, if I don’t issue you with an invoice until November 1, then you can’t reclaim the VAT until the Nov/Dec VAT return and you won’t get the VAT back until mid January. Yet you still have to pay me the full amount of €6,150 on December 1. What a difference a day makes! By having the invoice issued on the last day of the month, instead of the first day of the next month, you get €1,150 back into your business a whole two months earlier. Imagine if you were to actively manage your suppliers and request prompt issuing of invoices as a matter of routine, you could really get a lot VAT back into your cash flow two months early. How do you get suppliers to do this? Well you just ask. When goods and services have been delivered, ensure that invoices are in by month end and then you will always be able to reclaim the VAT as early as possible. Like most things in your business, you just need to know the basics and turn them into actions to get the best result. Do you have any tips for improving your cash flow or managing your VAT? If so, please let me know in the comments below! Excellent article, really well written and very illuminating indeed.